Our camp prices are all inclusive, which means there are no hidden costs. The price includes the registration fee, accommodation in a shared room with a private bathroom, daily room cleaning service, three (wonderful) meals a day plus snacks, all the activities, the use of sports equipment, arts & crafts equipment and materials, entry and exit English assessment tests, all academic materials, and English lessons or equivalent with qualified teachers. Prices are quoted per participant. Not included in the price are: extras such as transfers and excursions, personal expenses, medical or accident insurance and anything not specifically mentioned above. Students travelling to Italy alone are met by our staff at Rome Fiumicino airport at the arrival terminal, or at Termini or Tiburtina train stations in Rome. Individual transfers can be arranged for students arriving outside given time windows. All individual transfers are charged based on the number of passengers, the time of arrival/departure, distance between venue and airport/train station. Please notify us ahead of time of any student travelling as an unaccompanied minor so that we can provide you with the relevant details and the name of the person picking up the student. Cultural day trips to Rome and Florence are optional. All excursions take place on Sunday and are supervised by our staff. Travel, tickets to museums and archeological sites, guided tours, lunch and limitless water supply are all included in the cost of the excursion. Pocket money may be useful during excursions for a soft drink, an ice cream, or buying a souvenir. Our campers are covered from the moment they arrive at camp to the moment they leave. Our insurance protects them against accidental damage they may suffer or cause to the property or a fellow camper. Medical emergencies and general health issues that can be dealt with locally are covered by Italy’s national health system that guarantees full assistance to anyone in need, regardless of residency. Our insurance does not cover campers against travel delays or cancellations, booking cancellations, health related issues other than those described above, theft, or any other accident related to their trip. For these instances we recommend they take out specific student travel insurance. A 50% deposit can be made in order to reserve spots with payment in full made by April 30. All bookings made after April 30 must be paid in full upon booking. 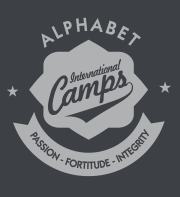 It is the right of Alphabet International Camps to refuse any bookings that have not been paid in full prior to the student’s arrival. The main contact for all booking needs and camp related queries.